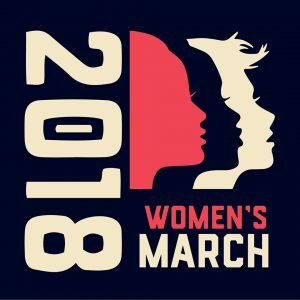 What a day for Women! What a day for people all over our country and the world. The skies were mostly clear, temperatures more mild, after last weeks frigid weather across much of the US. This year’s march showed that people are still showing up and are not backing away from the injustices being debated by the politicians in DC. 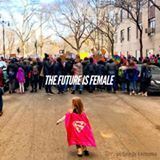 While the world watches, they, too, stand in solidarity in their cities, showing they march with with us. 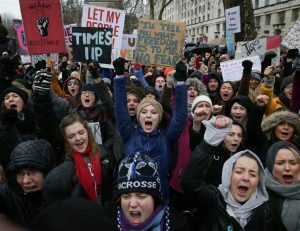 In London, demonstrators carried placards reading “We Are Powerful” and “Time’s Up” and chanted outside Prime Minister Theresa May’s office as they raised grievances ranging from workplace inequities to misogynistic abuse on social media, according to the Associated Press. The demonstration drew thousands, despite sleet and snow. Demonstrations were also in Paris, Berlin, Sydney and other European and Australian cities. 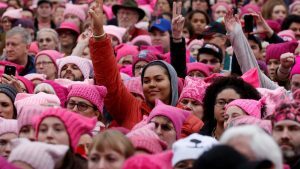 Not only were the “pink hats” out in force, they had multiplied from a year ago. Men, women, and children, of all ages, wore them with pride for the movement they represent. Being part of this gives me hope. Speaking to a few millennial college students, on the train ride home, gives me hope. They understand their voices are needed, their votes are needed and that apathy is the enemy. They all pledged to get people registered and to vote from among their peers and families. It’s a huge deal at their schools, too, to register to vote. I challenge us all to do the same. 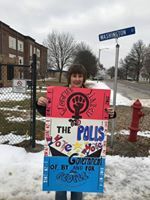 Here’s a sole protester showing up in her tiny Iowa town. Show up however you can! Our hope is in those who come after we’re gone. 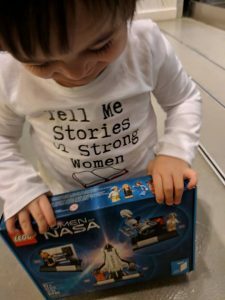 Teach our children well. They are the future we leave behind. Use words that empower them to become all they can be. And most of all, listen to what they have to say. You might be surprised at what they have to teach us. What words of wisdom has a “little” shared with you lately?